To get to share personal time with one of the NFL’s greatest quarterbacks ever surely means a lot for an upcoming rookie. That’s exactly what happened to newcomer Deshaun Watson. 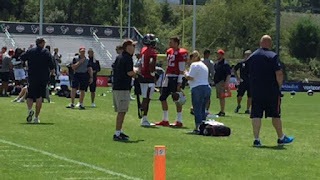 After Wednesday’s joint practice between the New England Patriots and the Houston Texans, Watson and Brady took time to speak with each other and offered words of mutual respect and admiration. Another thing that 21-year-old Watson can learn from Brady - who just turned 40 a few weeks ago - is longevity and how to sustain a successful career.